I urge you NOT to ignore this- This is your one and only early bird Private Invite to our brand new EVO PRO software release. Over 4 months… and over a Million Lines of new code has produced this amazing new software. This product has been in the market for 4 years and 9 releases, originally as BruteForceSEO. 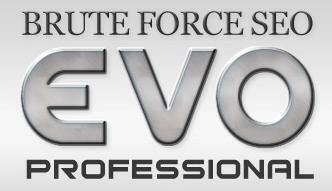 Brute Force SEO: EVOII Professional! * And many MORE incredible features coming, and more added constantly! Now here’s the deal: Next month, we are having a Massive Launch, and I cannot promise spots after this launch, the crush at the door will be THAT intense. So to honour all the people who have been following me all these years, you guys get in first via my private access. And of course it’s working phenomenally well in the search engines, I’m getting excellent rankings running the beta software with only 20% of the sites in it.